B CI has leveraged our employees' experience designing radars such as the Navy's SPY-1 radar to develop a line of modular, COTS-based detection and track processors for aircraft surveillance. Our adjunct track processors can be added to any radar with a digital I/Q data feed, and includes standard algorithms such as pulse compression/matched filtering, Moving Target Detection (MTI), Constant False Alarm Rate (CFAR) processing, and tracking filters such as alpha-beta or Kalman filtering. 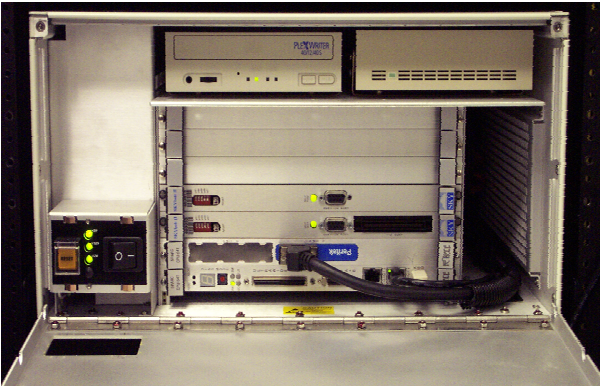 BCI's track processor share the same multi-processor architecture as our Weather Extractor Computer, which allows the system to be scaled from 1 to N parallel processors to meet the data rate and processing throughput requirements of the radar. This unique capability means the hardware complexity and cost can be matched exactly to the needs of the radar system, and can be upgraded as needed for new capabilities. The commercial hardware architecture is based on rackmount or blade PC systems - previously delivered systems have used Dell and Supermicro 1U rackmount servers and IBM Bladecenter systems running LINUX and Windows operating systems. BCI track processors have been delivered to the National Severe Storms Laboratory (NSSL) for use with the National Weather Radar Testbed (NWRT), a modified SPY-1 radar used for rapid scan weather detection, and the Naval Postgraduate School (NPS) for use on their mobile X-band radar system.